Luke is approaching 3 and because of that we are getting his big boy room ready. The first step in doing that is to get his room painted. When I paint a room I like to do it by myself. I find the methodical quiet work very relaxing. 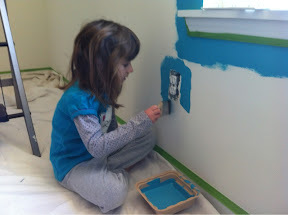 When painting Alyce's room we hadn't moved in and I had the house to myself. 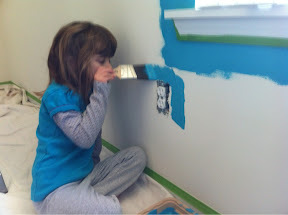 For weeks now Alyce has been asking to help paint. Mom and I's response of "it's a Daddy job" has been falling on deaf ears. This weekend I finally tackled his room and Alyce was ready to help. I started off cutting in the ceiling with Alyce sitting in the room with me. She was sitting under the desk because she didn't want to get paint on her head. What kind of messy painter does she think I am? As I neared the floor she started asking if she could help. I didn't have it in me to tell her no. I set up a drop cloth, gave a brief lesson, and let Alyce loose on the receptacles. I held her hand for the first one and needed to clean up her work when she was finished. But in all she did a pretty decent job. There was one paint splatter on the drop cloth from when she forgot to scrape the excess off her brush. 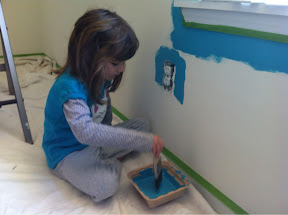 Later on while Alyce was in quiet time I pulled her out to finish the last baseboard in the room. I wanted her to have one final chance behind a brush. Alyce seemed pretty pleased with herself. I liked the bonding time. 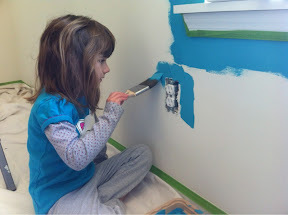 Even though I was kind of dreading painting with her in the room it turned out better than expected. The hard part in parenting is knowing what your kids are ready for. I didn't think Alyce had it in her. It turns out she did and then some. 0 comments on "Painting Helper"